Last week when I joined the new weekly Space Hangout (a webcast video conference call of sorts), I realized I would need a 3D model of Dawn in order to explain what's going on with the mission right now. I quickly folded a little paper box and labeled it to show how the high-gain antenna points in one direction while the GRaND neutron detector is on a different face of the spacecraft. It did the job, but it wasn't exactly up to my usual standard for illustrations. I've often wished I had handy models of spacecraft and thought about making a better one. But in what medium? Paper isn't very good (especially in my household with two young kids), since it's so fragile. Then, suddenly, I had the answer: plastic canvas. Plastic canvas is like plastic graph paper, and can be cut to size; it's assembled with yarn and needle, using needlepoint stitches. Unlike knitting or crochet (which I have done to represent a spacecraft before), plastic canvas is a medium that is excellent for representing hard-edged objects, and also excellent for making things to precise dimensions. After a fun weekend of work and a lot of time spent with Eyes on the Solar System viewing Dawn from many different directions, I'm quite pleased with the result, if I do say so myself. Presenting: the Dawn spacecraft, rendered at 1:50 scale in plastic canvas. This view contains the dish-shaped high-gain antenna and shows the side of the solar panels with the solar cells. One of the three ion engines projects forward below the high-gain antenna. The black lump above and left is the low-gain antenna, and the little gold thing above the HGA is GRaND. The Dawn spacecraft rendered at 1:50 scale in plastic canvas. Designed and stitched by Emily Lakdawalla. Here's another view, showing the back of the solar panels and the science instruments. GRaND is at the upper left corner; on the lower face are VIR and the twin Framing Cameras. The last view shows how the solar panels swivel (I used a piece of coat hanger wire inside the panels and through the body as the swivel). A closeup view of the bus. I stuffed the bus tightly with stuffing, so I can use it as a pincushion to stick in labels. I need to work on nicer-looking label pins. This was fun, and also pretty fast, so I think I'll be stitching more spacecraft! Now I have a question for you readers. 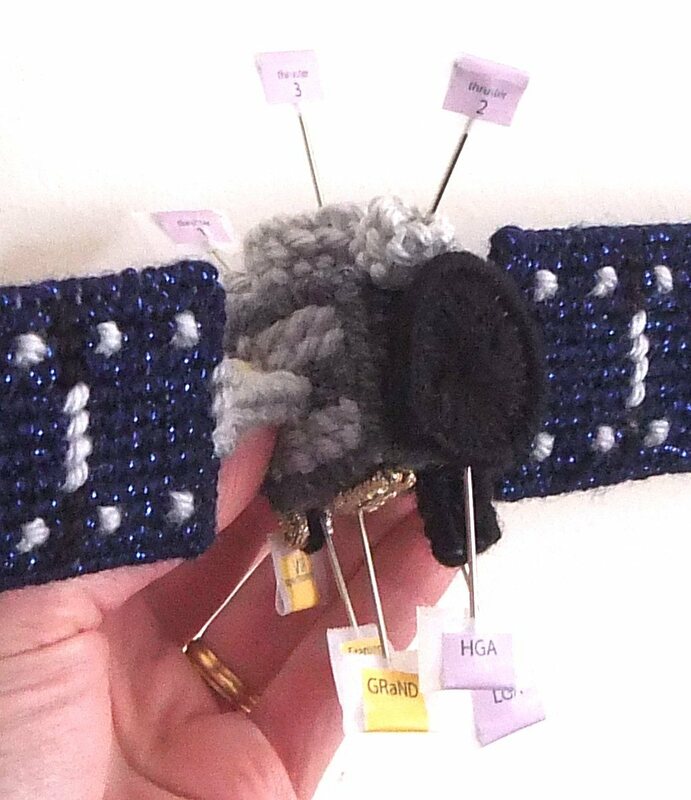 Is there anyone out there crazy enough about spacecraft to want to stitch their own? 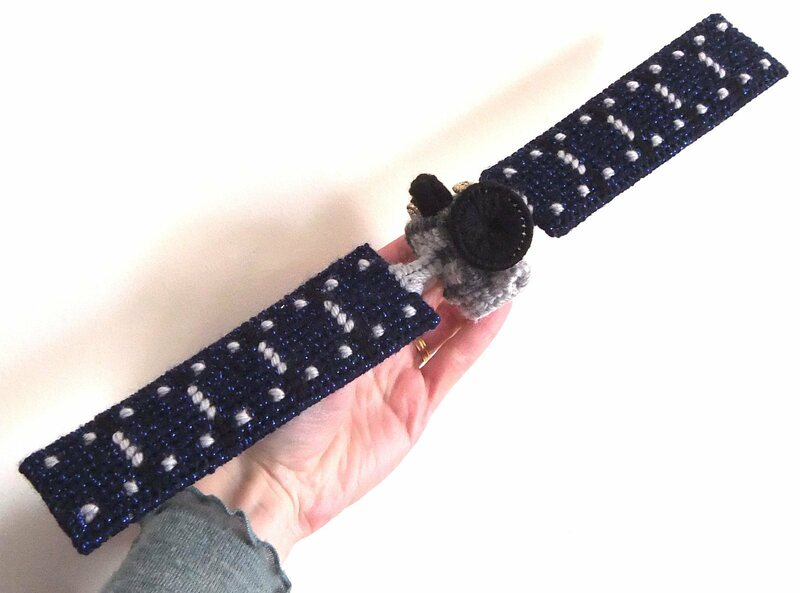 Should I write up a pattern and sell it on Etsy? Should I sell kits? Send me an email and let me know! This is so fantastic! My son is mildly autistic and has trouble focusing on academics but is so fascinated with space, he would just love his own little lifelike spaceship! Did you ever work up a pattern?